New Frodo Art Travesty: Caravaggio's “The Cardsharps”, plus jan-u-wine’s ‘The Wager’. "Elijah Wood as Frodo lends fresh luster to the term "beautiful youth." His transparent and expressive Caravaggio face, the visual equivalent of the Vienna Boys Choir, flits like an androgynous angel between human and Hobbit, man and child, male and female." ~ To see the full 01/20/02 article from The Washington Times, click here. I won't complain about her use of “androgynous” in this instance, since she uses the word to mean 'having qualities associated with both sexes’, rather than its second meaning, 'not particularly male or female'. Film-Frodo is not that sort of ‘androgynous’. But she is right on the money about the way he embodies within himself sharply contrasting elements: "human and Hobbit, man and child, male and female". And I think she is right to say that film-Frodo’s face is the visual equivalent of the Vienna Boys Choir, if she means that the beauty of their music is almost startling in its purity and near-otherworldly quality. His face is the equivalent of the pure tones that send shivers down the listener’s spine when a young soloist suspends a high note, sweet and true. But, actually, film-Frodo’s face is not like a face in a Caravaggio painting. Caravaggio’s youths are comely, but they are not the visual equivalents of the Vienna Boys Choir. Whether they are angels or gods or musicians or fruit-sellers, on close inspection his youths look like the rosy-cheeked, slightly fleshy teenagers they are. If looking at their painted images sends shivers down viewers’ spines, it is because of the way Caravaggio painted them, not because of the way they actually look. I think film-Frodo reminds people of a Caravaggio not so much because he actually looks like the people in those paintings, but because he is presented the way Caravaggio might have presented him (especially in Caravaggio’s later works). Frodo’s face is full of drama and pathos, violence and inward reflection, set off by gorgeous textures and colour, every feature bathed in luminous light where it isn’t swathed in velvety dark. 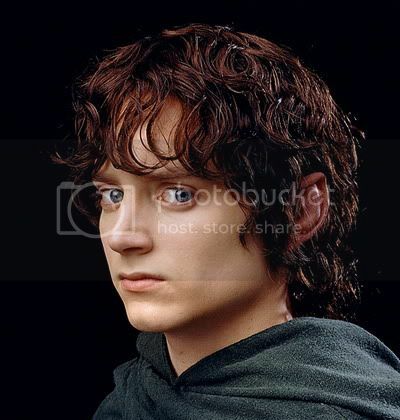 Film-Frodo, with his strong bones and cleanly-chiselled features, has a face like no Caravaggio youth ever had. But the way he is “painted”—the colour, the drama, the light—is pure Caravaggio. He’s a creature of contrasts, just as Ms. Combs said: he moves between—or embodies simultaneously—“human and Hobbit”, “man and child”, “male and female”. I would add to these contrasting pairs, “earth and air”, “flesh and spirit”. As much as film-Frodo is a creature of fire and spirit, like Caravaggio’s youths he is a creature of earth; flesh-and-blood. He’s mortal, he’s woundable, he’s possessed of appetites. He sweats, he weeps, he bleeds. He’s like a living, breathing manifestation of Caravaggio’s stunning use of light and dark—contrasts in lighting—for which he is so justly famous. Film-Frodo is so luminous he seems lit from within. We never tire of talking of his almost preternatural radiance, a visible token of the “fire and spirit” within him. Yet along with the light are the shadows, so dark in places they remain impenetrable—another reason we are still talking about him. None of us may discern what is in the dark places in his soul, but we don’t stop trying. Uncovering them will be like uncovering our own dark places, we so identify with him and his journey. To the pairs listed above, then, we add not only “earth and air”, “flesh and spirit”, but (once he reaches the dark heart of Mordor), “Heaven and Hell”. Like in a Caravaggio painting, Frodo is taken to the extremes of experience and being, gloriously. For those who identify with him imaginatively, he takes us there with him. For this post, the discussion of the painting and painter will come first, after which I will make a few reflections about Frodo in the finished manip, then Jan-u-wine's poem, The Wager. A brief "making of" section concludes the entry. 1. About the source painting. The painting for this manip, “The Cardsharps”, represents some of Caravaggio’s early work at its best. When he arrived in Rome in 1592, with no money and nowhere to live, he survived by doing hack-work in the workshop of the Pope’s favourite painter, Giuseppe Cesari. He did the “still life” elements within the paintings: the flowers and fruit and physical details of the background scene. Determined to paint on his own, Caravaggio left the workshop in 1594, a tremendous risk. Luckily, before he managed to starve he met people who would be helpful to him, patrons and fellow-artists, including a painter even younger than he, Mario Minniti, who posed for this and several other paintings done before 1600. All Caravaggio’s subsequent paintings display the fruits of his early “hack-work”, in their beautifully-rendered physical details. Whether he’s painting a saint or a street-villain, a palace or an impoverished interior, every object becomes a thing of beauty, exquisitely rendered and just as exquisitely lit. But he was not only good at physical detail, he was good at psychological detail, something that can be seen in “The Cardsharps”. This painting and a similar one, “The Fortune Teller” (showing a gypsy palm-reader cheating a gullible youth, Mario Minniti again the model), were very popular, although not immediately. Caravaggio sold these paintings for practically nothing. Eventually they were copied many times over by other artists; over 50 copies of “The Cardsharps” survive. In the painting, a young gentleman is being cheated at cards by two other men, one younger, one older. The young gentleman is expensively but soberly dressed in elegant black with spotless white lace at the collar and cuffs. He appears quite unaware of what is going on, very relaxed as he gazes at his hand. The youth with whom he is playing, dressed in flashy garb, watches his “mark” with bated breath, leaning closer as he pulls hidden cards from his waistband. The “mark” can’t see him doing it, but the viewer can. Surreptitiously, the older man peeks at the young gentleman’s hand, signalling to the younger cheat. It’s a psychologically interesting scene, providing more than a pat moral lesson (“Be careful playing cards with people you meet on the street”). The well-off youth on the left is being cheated, true, but so is the young accomplice, who is losing his moral innocence by learning to be a cheat. The older man is inured to the game, but he does not appear to be doing too well. His clothing has seen better days, the cloth dingy and the finger and thumb of his glove out at the seams. Perhaps crime doesn’t pay that well, not just monetarily, but on other levels. The viewer hopes the young player realises he is being taken before he loses everything he has, but perhaps it is better that he doesn’t notice. The dagger hanging from the nervous young card-sharp’s belt is very near at hand. Personally, I love the way Caravaggio renders what is going on between the “players”, through their expressive faces and body language. I love the subdued warm colours, and, of course, the lighting. But it is the detail-work that makes me keep coming back to the piece, my eye lingering over the intricacies and textures of the table cover, the playing pieces and cards, the fabrics and feathers, as well as the hilt of the accomplice’s dagger. I would love to see this in person. I saw Caravaggio’s “Ecstasy of St. Francis” last year in a travelling exhibit, and the difference between seeing the painting in copies and in person was an eye-opener. 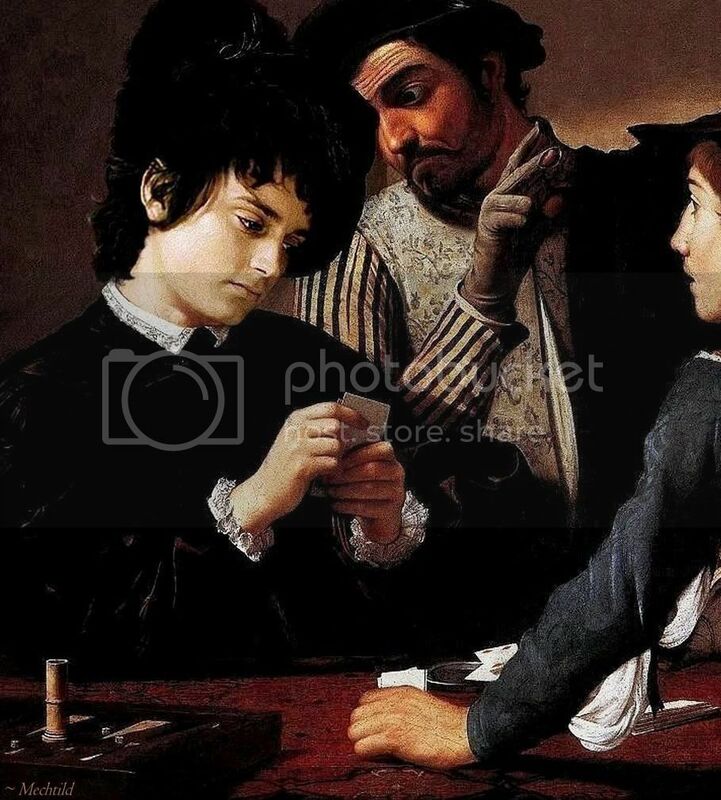 As I said, the model for the face of the young gentleman being cheated is that of Caravaggio’s fellow-painter and younger friend, Mario Minitti. He is the model for every one of the Caravaggio ‘Frodo Art Travesties’ I have made so far (see links at bottom of entry), paintings all done before 1600, when Minitti was a favourite model. When I first saw “The Cardsharps” I was sure I’d want to do a “Frodo Art Travesty” from it one day. I thought it could be an illustration of Frodo in Minas Tirith, after the war. Not literally an illustration—the scale of the card-sharps is wrong and Frodo has all his fingers. But it made me think of what life might have been for Frodo, being invited to various places in the City through his far better-connected friends, meeting the people, seeing how they lived, how they coped with loss and how they met the future. Maybe it’s from reading so much angsty fanfiction, but it is there that I imagine Frodo first feeling uncertainty about making a full recovery. He was well on his way to regaining his physical strength and health, but surely the initial euphoria he felt over the defeat of the Dark Lord and the liberating of the land had begun to wear off. When Frodo first learned he had been spared, along with everyone he loved, he was filled with gratitude and joy. At Cormallen, he was still weak and a bit overwhelmed, but he was pleased, if abashed, at the subsequent honouring ceremonies and the Coronation. But in the time that followed, sharing the house in Minas Tirith, in my mind's eye I imagine Frodo beginning to recede, if just a little. Although the White City had suffered—reminders of loss would be everywhere—the primary mood was hopeful. Hearts and hands and minds were occupied with the clearing up and rebuilding, and people who might never have known each other otherwise were coming together to work and to celebrate. As Frodo watched his cousins and friends recovering the old rhythms and pleasures of their lives, and enjoying new ones, having become comrades in arms with mighty Men of Rohan and Gondor, would he have been able to stop himself from making comparisons, feeling that he was lagging behind, somehow wanting? Not only had he not recovered comparable gusto (in my angsty imagining of him, that is; he seemed happy enough in the book), there were moments, images, glimpses creeping back into his consciousness of dark things from the past. I imagine him happy for his friends in Minas Tirith, for the land, even for himself. But I also imagine him being troubled by the return of pain from wounds that were supposed to be healed, and a desire that ought to have died with its object. These unwanted and unexpected physical and emotional reactions could not have been encouraging to a heart weary and desperate for peace. I can only think that it would unsettle him, try as he might to resist dwelling on it, the result being a subtle withdrawal from others, at least at times when he was experiencing troubling thoughts and feelings, or trying to process them. I wanted the face I chose for the manip to be one that would capture Frodo in this mood, sitting in a card game, playing along, but actually in his own world, trying to work out his thoughts and feelings. As I said above, the manip isn’t meant to be a literal illustration. The card-sharps are obviously not characters from LotR, nor is Frodo an early Baroque gentleman (with his right ring finger still intact). But, in the world of this manip, I have imagined that the card-sharps are two Men, soldiers of Minas Tirith—a young recruit and a seasoned campaigner. Perhaps they are soldiers Pippin met. I do not think they are really trying to cheat Frodo, a prince of the Halflings, not to mention the King’s friend. They’re just horsing around. It’s all in fun. Frodo knows what they are doing, and when they reveal their prank he will laugh. But his laughter does not reach his eyes, which are seeing other things than playing-cards. For viewers with very large monitors, or for those who simply would like to see Frodo or the whole painting in better detail, the largest version (1100 pixels wide) of the full manip may be seen by clicking HERE. Note: When the image opens, it immediately defaults to a smaller size. To open it to full size hover the mouse over the lower right-hand corner: click the button that appears. I began planning to do this manip in August. I sent the source painting to jan-u-wine, asking if I could use one of her poems to go with the manip when I made it. There were a couple of poems set just after the fall of Barad-dûr which I had not already posted with screencaps that I thought beautiful. They didn’t have to do with the painting’s scene, precisely, but they shared the reflective, sombre mood I meant to bring out once Frodo had been added. Jan-u-wine replied—with a poem inspired by the painting! The new poem, The Wager, matches the finished manip in an almost uncanny way. I mean it matches the mood of the manip, created by the look on Frodo's face in the scene. If I were a better digital artist, I would have given him a missing finger to make the match even better. Alas, I am not. So I will let Jan do with words what I could not, for all my fancy cyber-brushes and paints. * P.S. Thanks so much, Jan, not only for proofreading this entry, but for your great suggestions during revisions. It is grey Spring in the city of the Sun's Tower. of the Guard of the First Level. I have wandered each circle of the White City this day. Even the ghost-grey Pelennor has known the touch of my foot. As the day dies, I find myself within the near-cheerless haven of the Guard. bitter remnants of more bitter wine sluggish within an age-stained skin. The Men of Gondor would instruct the Halfling Prince in card-play. I am proved inexperienced at deception. Not so the Men of the Guard. The knowing eye of one of them is not an arm's length behind me. A whisper of advice dies upon his tongue. And two others, bearing the device of a heart, but of no royal bearing. laid ready upon the table between us. I have lost my hand. to the loss of a finger. and that with which I wagered it. 4. Technical Matters: Behind the Manip. As usual, I selected a variety of different “possible” Frodo faces from screencaps, but I quickly made my decision, choosing a face from Frodo and Bilbo's ride to the Grey Havens. The source screencap was cut so tightly, little of Frodo’s hair remained in view. Not only the top, but the left side was out of frame. Extra hair would have to come from some other scene, though, since none of my caps from this scene showed a full head of hair. I finally despaired of finding a Frodo with a full head of hair shot from the right angle from among my screencaps, but found an image I could use in Pierre Vinet's publicity portraits, shot before or during FotR. It would have to be flipped, was too sharply focussed, and the hair too red, but those things could be adjusted. After reaching a final decision on the size, angle, and set of the head upon the newly positioned neck, I was ready to put everything together. First I tweaked my copy of the Caravaggio, which I thought a little too wan and washed out. Then I adjusted the new face and hair pieces to match the painting in hue and lighting. Still working with the image in a moveable-layer png. format, I shifted the elements around by increments until I thought they looked right. I “pasted” them all down, saving the composition as a jpg. document, then went on to the next steps. To make the hair pieces blend with each other, and the head, neck and hair blend with the background painting, I did a lot of hand-painting with the “clone” tool. The hair and collar area required the most work, but there were faults in the source painting around the edges that needed cleaning up, too. I used the “blend” tool to diminish the paint cracks on the younger card-sharp’s face, so that it wouldn’t be so different in texture from Frodo’s photographic one, which was much smoother. When I had got the hair and face worked in, I adjusted the new area further, trying to get an even better match with the painting’s colour and lighting, and increasing the sharpness. I also brought down some of the redness in the original model’s hands and wrists, which were far too ruddy for the paler Frodo. Finally I made limited use of an effects filter. Selecting the new face and neck, I applied a semi-transparent layer of “Eggshell” to break up the surface a little, so that it would better resemble the surface texture of the painting. ETA: At the very last, but only because I forgot to do it after finishing the hair, I replaced his lovely ear-tip, using a copy from the screencap for the face (tweaking it to match and so forth). I had covered it up, applying the extra pieces of hair. For those who prefer the ear-tip left in mystery, the earlier version may be seen here (be sure to click the image open to full size). ~ Caravaggio: 'Bacchus', re-done and presented 12/19/06. ~ Caravaggio's 'The Lute Player', presented 10/30/06. This entry has the most material about Caravaggio and about the young models he painted in many of his works. 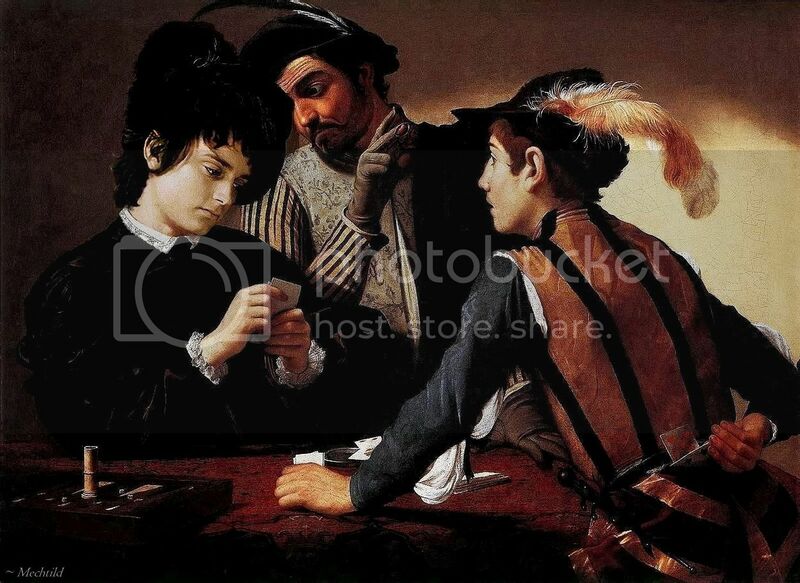 ~ Caravaggio's 'The Fortune Teller', presented 4/14/06 with three other re-done manips. Oh what an incredible journey into your pictures this took me through. I showed my girls how amazing his likeness fits and how you did it. They thought it was cool. As you said, the lighting and texture of Caravaggio lend itself in all luminescent glory to Elijah's face. His face is so classic and his soul seems to come from within to the surface in his expression. He speaks to the camera much as artists speak through their hands and brush. I was thrilled to see that quote about him because it is something I have always seen in him. "androgynous angel between human and Hobbit, man and child, male and female." He is simply, unique, and a beauty to be appreciated simply as he is, just beautiful. His face is so classic and his soul seems to come from within to the surface in his expression. He speaks to the camera much as artists speak through their hands and brush. He *does* speak to the camera like an artist, but using his expressions and face rather than hands and a brush. I liked the way you said that, Verangel! YES. Unique, and uniquely beautiful. I am so glad I used that quote, since you hadn't seen it. It's one of the most memorable ones I've ever read, and I had saved that article when I first read it, which was already a couple of years after it had been written (in 2002). Thanks so much for the link to that article - I hadn't read it before. I love her (and your) descriptions of Elijah's Frodo and couldn't agree with you more (but I could have never said it so well). So many times he leaves me just speechless and breathless. The work that goes into these manips is amazing - but so appreciated. 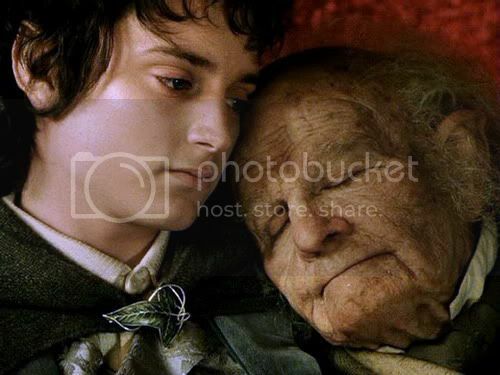 It really showcases the beauty and expressiveness that is Elijah's Frodo - and then to have that wonderfully, hauntingly poignant poem to go with your manip - it's just perfection. Thank you both SO much for sharing your talents and helping me to re-appreciate over and over the wonder that is Elijah's Frodo. I am so glad I came across this article, too. I saw the Marian Coombs quote again in a string of reviews on Blossom's website (I've been poring over it because I want to do a presentation on it in my my LJ, as a sort of promotion). I thought, "Look at the date of that review! It's almost exactly six years from when it was published!" I didn't read the article until two years after she wrote it, but that quote just hit me on the head and I saw stars, or the light. Thanks so much for you comments, Frolijah Fan. I am very pleased you enjoyed the manip and poem so well. I just love seeing how you create these manips. It's like seeing the drafts of screenplays as they become crystallized into the final version. if she means that the beauty of their music is almost startling in its purity and near-otherworldly quality. His face is the equivalent of the pure tones that send shivers down the listener’s spine when a young soloist suspends a high note, sweet and true. Thanks for the comment, Shirebound. Re-reading the passage you quoted makes me want to listen to those sections boy soprano Ben Del Maestro sings on FotR. Perfection! Once again, you ladies have made me shake my head in wonder and touched my heart. Thank you. p.s. And thank you for the link to that article - that's one that I somehow missed the first time around. Marigold, thanks for stopping in. It's a great quote, isn't it? And I'm so glad you enjoyed our efforts. As much as film-Frodo is a creature of fire and spirit, like Caravaggio’s youths he is a creature of earth, flesh-and-blood. He’s mortal, he’s woundable, he’s possessed of appetites. He sweats, he weeps, he bleeds. He’s like a living, breathing manifestation of Caravaggio’s glorious use of light and dark—contrasts in lighting—for which he is so justly famous. Film-Frodo is so luminous he seems lit from within. We never tire of talking of his almost preternatural radiance, a visible token of the “fire and spirit” within him. Yet along with the light are the shadows, so dark in places they remain impenetrable—another reason we are still talking about him. None of us may discern what is in the dark places in his soul, but we don’t stop trying. Uncovering them will be like uncovering our own dark places, we so identify with him and his journey. To the pairs listed above, then we add not only “earth and air”, “flesh and spirit”, but (once he reaches the dark heart of Mordor), “Heaven and Hell”. Like in a Caravaggio painting, Frodo is taken to the extremes of experience and being, gloriously. For those who identify with him imaginatively, he takes us there with him. What a brilliant, profound commentary, Mechtild! Apologies for quoting this entire paragraph, but what you said about Frodo here ~ the light and shade that are so much a part of his character are perhaps also what makes him appealing to many of us ~ I do believe that is true. He's real, yet he's unfathomable, and he's fascinating. I love this manip ~ you really do have a talent for choosing exactly the right screencap. I marvel at your skill in combining the face and hair from different images, and then blending it in so seamlessly with the original painting. That Jan-u-wine produced her beautiful poem especially for this manip leaves me full of admiration. Blossom, I was telling a commenter above that it was because I saw the quote on YOUR site. It's in the string of reviews for FotR. I've been working on the manip for a while, on and off, but I had only just finished it at the end of last week. It so happened that that was when I was poring over your site and making notes. I saw the quote and noticed the day it was published! Wow, I thought, what a coincidence! I felt it was somehow "meant" that I should talk about it. I was impressed when I first read that quote when it appeared in someone's comment at TORc in a Frodo discussion. I asked the commenter right away, who said that? Where does it come from? She gave me the link. I copied and pasted it into a document to save but misplaced it. I was thrilled to see that the article is still on the Internet. I just typed in Ms. Coomb's name and a few words from the quote and there it was. This time I'm filing it where I can find it again! Thanks so much for your thoughtful comments, Blossom. It is a joy for me, and for Jan, to make these things, but it's all the better when devoted fans are touched by them. What a multi-layered treat this is! First the beautiful integration of Frodo in this classic painting, so wonderfully and inventively achieved. His marvellous face has such a timeless quality and the manip so perfect that it seems impossible to the viewer he was not the original model! Then to have such a poignant and convincing backstory makes this less an artful image than an evocative illustration and lifts the experience from the visual to the emotional. The reflection on the Coombs quote was deeply thought-through (I had seen the quote before and always wished to read the whole review) and the observations of film-Frodo added yet another layer to my appreciation. And to crown it all, another stunningly beautiful poem from jan-u-wine, insightful and moving as always - with a devastating last line. Whenever I visit here, I feel as if I have been lovingly guided to an enhanced perception - of the source paintings, the films, Frodo, Tolkien, poetry and language in general. Thank you both, for having such an incredibly creative partnership, and the generosity which allows us to share its fruits. Many hugs! Oh, I remember this article very well! I was so happy to read such a lovely and enthusiastic (and perfectly accurate! :)) description of Elijah as Frodo... Everybody around me seemed to find him strange, too young, too weak, too feminine, and I felt very alone in my admiration. Bagma, you are very gracious! I am so glad you enjoyed Jan's and my work so much. And very gratified that you told us so. Thank you! That was a great excerpt, wasn't it? When I first read it in someone's comment on a messageboard in 2004, it was an "Ah ha!" moment for me. Thank you so much, Not Alone! Oh, my. Superb, Mechtild! And the poem is perfect. He's the beautifullest of hobbits, and that's saying a lot. He *is* beautifullest, isn't he? *bosom swells as if this somehow reflected on me* Not only the beautifullest of hobbits but of everyone. You've really become a master (or should that be "mistress"? :D) of your art, Mechtild. What a superb job! And it's interesting, as a sometime manipper myself, to see the steps you've gone through to achieve such a seamless result. I fully intend to see some of Caravaggio's work in the flesh, so to speak, when I'm in Italy in May. I don't suppose you know where 'The Cardsharps' currently resides? Thanks for the lovely comments, Scarlet. I feel like the cat who got a dish of milk straight from the cow. Oooh, that's right--you're going to Italy! I am sure there are some Caravaggio's there, but there may be fewer than one would expect. Caravaggio was a huge hit in his day, but he and his era of painting fell into almost complete obscurity for centuries, I believe. Paintings got lost; some were even painted over, if I recall the tale properly. He wasn't "rediscovered" until the twentieth century, when he was massively appreciated all over again. The result of his fall into obscurity for so long may be that his works (which survived) were all sold away to far-flung collectors. That Ecstasy of St. Francis I mentioned belongs to a gallery in Connecticut (U.S.A.), the gift of a rich collector-philanthropist. The Cardsharps is owned by an art museum in Ft. Worth, Texas! But you never know. I saw "Ecstasy" right here in Minnesota, at the art museum in Minneapolis (the big city in this state), where it was part of a travelling exhibition of Baroque art. You might want to look in this online resource, WGA (Web Gallery of Art). You can see there are several pages of thumbnails for him, which are very easy to view, with little blurbs, all of them expandable. They always say where a picture is currently owned or exhibited. Maybe you could find out from it if there's a "can't miss" painting in one of the museums you'll be near. The WGA doesn't have everything, of course, but it's the best I've found as a "one-stop source" kind of place. It's beautiful! Thank you so much for posting this! And thanks to Jan-u-wine, who takes me through Frodo's journey again and again, always going deeper and always drawing tears from my eyes. I love the way her poetry is one with Tolkien's vision. Her poems remind me of reading braille. It's a different experience altogether, tactile, close, physical. Thanks, Eandme. And what a cool way to describe reading Jan's poetry! It really is like something one experiences rather than reads, isn't it? Or, one reads it, since enjoying the look and sound and feel of the language chosen is part of the pleasure, but one is "in" the emotional world of the poem at the same time as reading it. The words are the medium--but what a medium! Like the boats of the Teleri, beautiful, but swift and sure to carry their passengers to Elvenhome. As always, you do beautiful work here. Exquisite and not forced at all. And I enjoy the art lessons just as much as the artwork itself! I remember that article; it was one of the first reviews I saved. I think Marian Kester Coombs could get free drinks from the article for the rest of her life, if she hung out in the right places ;) . Thanks so much for coming and taking a look, Westmoon! Ooooh, that is another great one! The colours of his skin/hair fit so perfectly as does his expression. thank you! Frodo looks good in black velvet. I love the beret. And I really love Frodo's voice in Jan-u-wine's poem. Fro playing cards with the war-weary men of Minas Tirith. What a great concept! Book Frodo often has a wry sense of humour. I regret that wonderful quality of his often got lost in the (sometimes) questionable characterisations of him in the fandom. You're too hard on yourself, Fro. Isn't that fantastic? That's for lifting out that section. I love it when people cite things, it also brings different nuances out of texts, the way close-up shots do looking at art.